The Easter Road midfielder claimed the Championship’s player of the year award after a scintillating first season with the Capital club and Stevenson sees no reason why the 24-year-old – enjoying a new lease of life after an unhappy spell in England – can’t do it again. And, although there’s been continual speculation linking the 24-year-old with a move to Rangers and Celtic, Stevenson believes Hibs, who insist there have been no approaches for the former Dundee United player, are intent on holding on to him. He said: “Scotty makes things happen all the time and I am sure people would pay just to watch him play. He’s a top player, great to play with and he makes a big difference for us. The club is ambitious, they want to keep their best players and Scotty obviously one of them. He makes so much happen and most of our chances come from him. And, Stevenson believes, Allan will prove to be an even greater threat to opposition teams as he seeks to add goals to his game, the midfielder on the mark for the second game in succession – following up his strike against Berwick Rangers – with a fantastic, curling effort to beat Dunfermline goalkeeper Sean Murdoch on Saturday. Hibs complete their preparations with a trip to face Ayr United at Somerset Park tomorrow night before opening their season as they did this time last year by taking on Rangers in the first round of the Petrofac Training Cup. 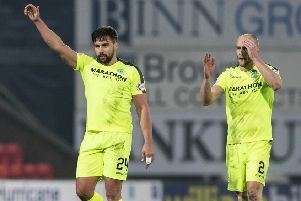 Stevenson admits the gane has taken on added significance with many seeing the Championship title as a two-horse race between Hibs and the Ibrox outfit. And he sees Saturday’s match as an opportunity to lay down an early marker. Stevenson feels Hibs are in far better shape than they were as year ago, Stubbs having arrived to find a club in disarray following the humiliation of relegation and with barely enough players to field a team.